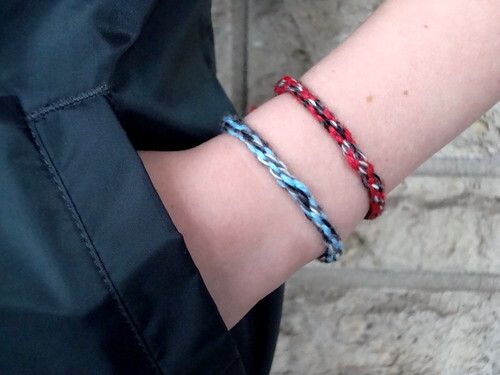 Much like the Friendship Pins featured in a previous installment of Craft Apparent, Friendship Bracelets are a crafty staple in a kid's social life. Making and trading these treasures encourages our children to place value on putting time, thought and effort into gift giving. 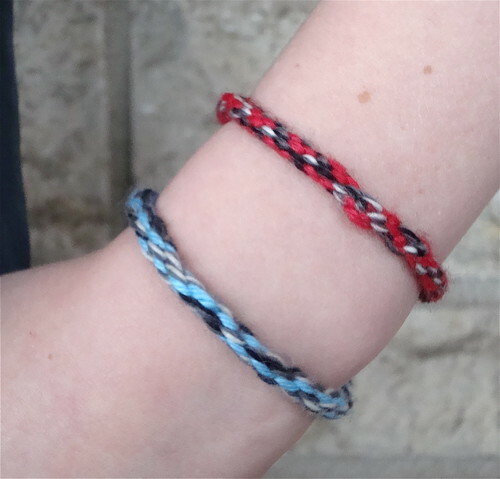 There are many different methods of making Friendship Bracelets but in my humble opinion, Japanese Braiding (aka "Kumihimo") is the simplest and most instantly gratifying of all of the techniques. Since fast & easy= good and setting kids up for creative success is key, this craft is a win-win in my book! You'll need a braiding disk before you can get started. To make your own, trace around a cup onto cardboard. Cut circle out; poke a hole in the center, and cut 8 slits, evenly around. Measure wrist then cut 7 strands of yarn (in desired colors) that are at least double that measurement. 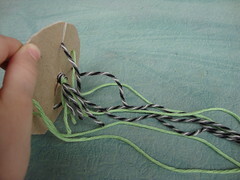 Hold strands together; poke them through the center hole of the disk. Leaving a 2" tail, tie a knot to keep the yarn in place. Place yarn strands in 7 of the 8 slots of your disk. Turn the empty slot to the bottom. Move the third string from the empty slot, into the empty slot. Rotate disk so the empty slot is on the bottom. Repeat the last 3 steps until cord is the desired length. Remove strings from disk. Knot the 2 ends of the cord to create bracelet. Keep in mind, Japanese Braiding is a portable craft so your son or daughter can make bracelets in front of the TV, while waiting in the doctors office, or in the backseat of a car. Special thanks to the Craft Yarn Council and the Weavers of Orlando, for sharing this technique with me! It's that time of year when love & friendship are in the air! As your children gear-up to give cards and chow down on chocolates remind them that nuthin' says luvin', like something handmade! This year the kids have the opportunity to open their hearts not only to their loved ones but also, the victims of the horrific earthquake in Haiti. Encourage the kids to get crafty. 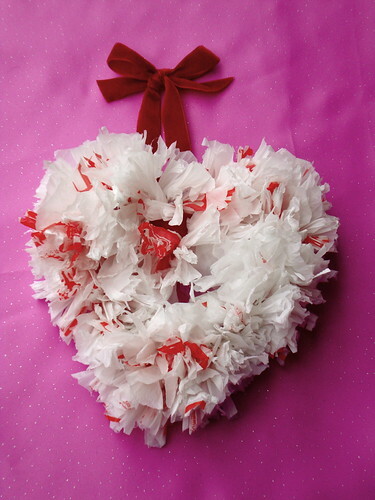 In addition to making heart-related projects for friends and loved ones, how about making some extras to sell to neighbors, relatives and other safe buyers? I've put together 3, love-inspired crafts: an embellished frame, plastic canvas pouch and recycled wreath--none of which are too difficult for a child under 10 to handle. If you'd like, use these with your kiddos to start (or continue) a dialogue about charity, compassion and humanitarian responsibility. Children often feel helpless in the face of tragedy but with the willingness to use their hands (and their hearts), they're really quite powerful! Their crafts can make money for those who need it most and even if they're only able to raise a dollar or two, their efforts set in motion a universal, "pay it forward" plan! Paint frame front and back, applying a second coat if necessary. Let dry. Apply a thin layer of gloss coat. Let dry. Glue Scrabble letters in place. Apply a layer of glue around the edge of the frame opening. Sprinkle with glitter. Let dry; shake off excess. Using red yarn & needle, fill in plastic canvas heart with stitches. Plastic canvas looks like a graph; you're stitches with be a series of diagonals. To sew a stitch, come up through a square on one row then down through the square caddy-corner to it, one row above. Once finished, repeat for 2nd heart. With wrong sides together and using turquoise yarn, whip stitch heart sides and bottom together. Whip stitch around the tops of both hearts to create decorative edging. Stamp a saying or lovey design onto a piece of fabric. 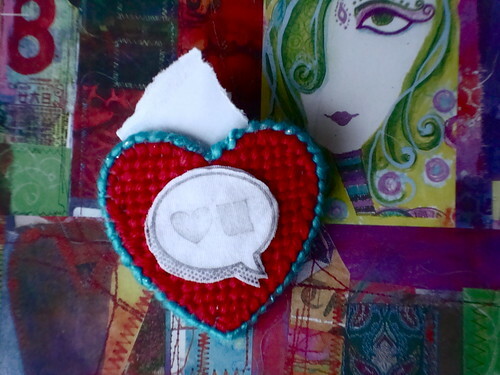 Cut out and glue or sew onto heart front. Slip a sweet message into your new, cute pouch ! Untwist the hook part of a hanger, enough to separate the ends. Bend hanger wire into heart shape; use pliers to re-twist ends to secure (see example here). Use wire cutters to snip off excess part of hanger. Cut plastic grocery bags into 1"-2"strips--they don't need to be perfect or pretty. Fold a strip in half, then tie it onto the wire heart. Repeat all the way around until entire heart is nice and packed with bag strips. Give wreath a "hair cut" to make heart-shape more apparent. Cut desired length of ribbon; loop through back of wreath; tie a bow. Set up an online store through Etsy! It costs pennies, there's no minimum for how many items you have to sell at one time, and you can upload pictures of your child's finished products right from your home computer! Make sure you also set up a Paypal account so people can purchase from you (this will obviously have to be under the parent's name as a checking account is required). Get permission from principal or leader to sell crafts at school or church. Ask a local business for permission to set up a small table in front of their store on a weekend day. Set up a limited time auction on Ebay. Here are a few suggestions of charities that are sure to get the money to Haiti as soon as possible. Remember, Valentine's Day isn't the only time to show a little love. The people of Haiti are going to need help for the rest of the year too, as well as the foreseeable future. Even if your family can't afford to donate money of your own, consider offering some handmade help whenever you can. 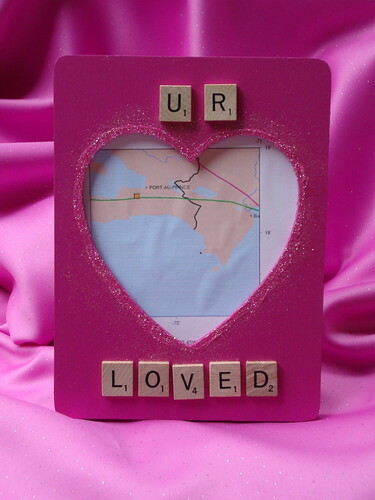 Happy Valentine's Day from Craft Apparent!